WINNING COLOURS FARM is situated in the picturesque town of Rockley which is a part of the Central Tablelands district of New South Wales, Australia. The FIRST EVER frame overo thoroughbred in Australia and in fact the Southern Hemisphere. WINNING COLOURS FARM is situated in the picturesque town of Rockley which is a part of the Central Tablelands district of New South Wales, Australia. We neighbour the historic 'Dunns Plains' property which is a 6000 acre sheep and cattle station owned by Fairfax Publications. As a boutique stud, our emphasis is always on quality not quantity. It is our passion and aim to produce fast, highly competitive performance thoroughbreds with the elusive frame overo gene. And now dilute thoroughbreds that can win races and match it with their solid coloured counterparts. Breeding for colour is in synergy to the ultimate responsibility of breed improvement. Temperament and performance must always take precedence over breeding for colour alone. This philosophy is the basis of our breeding program and is reflected through our select stock. With this philosophy at the forefront, in 2007 we purchased the World class and performance bred coloured thoroughbred stallion, "PROFILE IN STYLE (USA)". The FIRST EVER frame overo thoroughbred in Australia and in fact the Southern Hemisphere. Frame thoroughbreds, although rare, are not new. 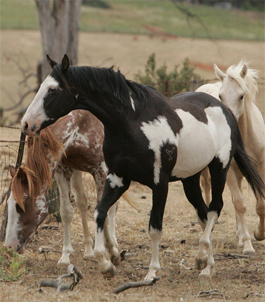 Overo thoroughbreds were documented to have occurred as early as the 1700's. Left is a picture of an oil painting made in 1790 of racehorse "King Of Trumps" owned by King George III. It hangs in the Sudley ArtTri Chrome Gallery in Liverpool, England. 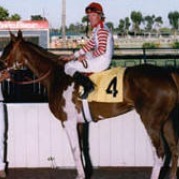 Then in 1993, the thoroughbred "Tri Chrome" was born (pictured right). 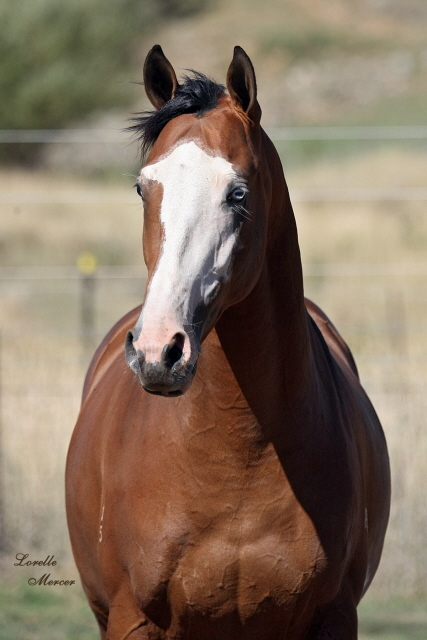 DNA tests confirmed his purity and although never bred before his death the World knew once again that FRAME Overo thoroughbreds can and DO exist. With the Australian Stud Book recognising dilute thoroughbreds in 2009 we were delighted at the opportunity to finalise our purchase of the superior and most promising Cremello Thoroughbred stallion,"GLACIAL GOLD (USA)". 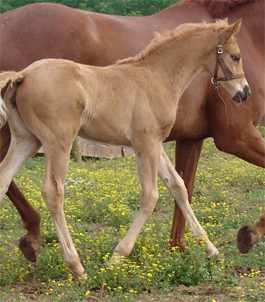 Dilute thoroughbreds although extremely rare have long been in the breed and are documented in the earliest of recordings which go as far back as the 15th Century. 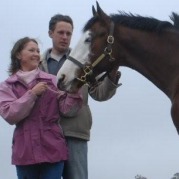 With such quality individuals as the mainstay of our specialised breeding program, owners CAN have it all. That being - temperament, ability, type AND NOW..... COLOUR! 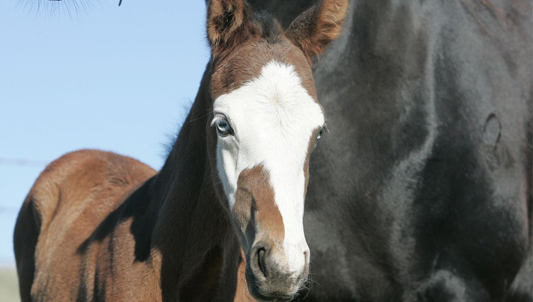 Adding colour without compromise ads a new element to Thoroughbred breeding and certainly ads excitement to life. We hope you join us. ""After viewing youngstock at a leading Show Horse Stud we travelled to WINNING COLOURS FARM to view a Profile In Style foal. We could not believe the laid back temperament and the "
""As a leading equine photographer I travel around the Country photographing the best horses Australia has to offer. Having the pleasure of photographing Profile In Style on two occ"
""After seeing the advertisement and picture of Profile In Style (USA) I needed to travel to WINNING COLOURS FARM to view this unique thoroughbred in the flesh. I was so taken by th"
""As an Equine Musculo/ Skeletal Alignment Specialist I do inspections for many business people at the Magic Millions Sales. 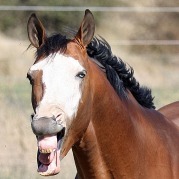 It is my business to assess sales horses con"